We enjoyed most of this story, but there was a lot of repetition about some aspects, such as her life as an apprentice at the shop, family issues, which boy to pursue and some of the politics. 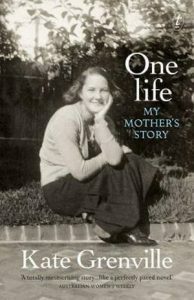 We thought the writing style was a bit unsophisticated but think that Kate Grenville was trying to express things using her mother’s voice and expressions since it was her mother’s story. The second half of the book dragged a bit and we couldn’t understand her reaction on finding out about her husband’s affair since she’d had one herself with their good friend. It showed how hard it was for women in unhappy marriages to leave when they had children and no way of supporting themselves. Overall, we thought it showed how far the role of women has come in the workforce. We had never considered the challenges faced around childcare in a time when there was nothing established outside family help. She certainly had courage setting up her businesses and helping to build the house. Nance was an impressive woman for her time. Wishing readers happy summer reading, from the Dundas Readers. This entry was posted in Australian Authors, Book Club Kits, Book Reviews, Non Fiction, Recommended Reading and tagged Book Club, book kit, Kate Grenville by admin. Bookmark the permalink.